Open cable grommets can be used for installing cables that are already fitted with connectors before inserting them through the cable entry frame. This allows for fast, economical and tool free handling of cables. 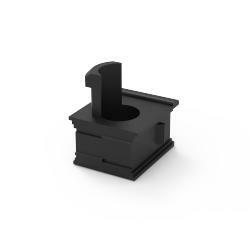 Mounted together with the CCF cable gland plate, CCG grommets are used to easily route cables fitted with connectors. The grommet is positioned around the cable and is equipped with catch hooks that anchor themselves in the CCF cable gland plate. Strain relief is achieved by using a simple cable tie. IP 54 with suitable gland plate and cables. Open cable grommets allow for a wide range of cables sizes to be installed. The cable entry frame can be made up of different open grommets to match customer requirements. Open cable grommets can be installed onto cables that are already fitted with connectors before they are installed into the cable entry frame. The cable grommets can be changed if required. The cable grommets, CCG, are to be used with the gland plate entry accessory, CCF.